While searching for photos from the Row River Valley I often find old timber scenes and old family portraits, but this is a rare combination of the two. This is the Row River Lumber Company in 1909. They were located where Vaughn Creek meets the Row River. The company was owned by Albert Stocks and Carrol Harlow and perhaps it is the family of one or the other shown in this photo. I grew up in CG, in town. I was wondering if had any old photos of WWI vets, or soldiers on leave. I recently did a study on WWIvets in CT and it got me thinking about the vets who might have been from my hometown. I would love to see pics with some names.Our soldiers of that war nationwide were not received well. Wounded vets, if their bodies were deformed by injury could receive a police citation for being in public. Sad in deed. I will poke around and see what I can find. I know that Kelly Field in Cottage Grove was named after the 1st soldier from the area to die in WWI. He was actually from Dorena, I will need to look up his first name. Are you any relation to Eleanor Corey, who taught at Dorena School for many years? Great picture, Katy. 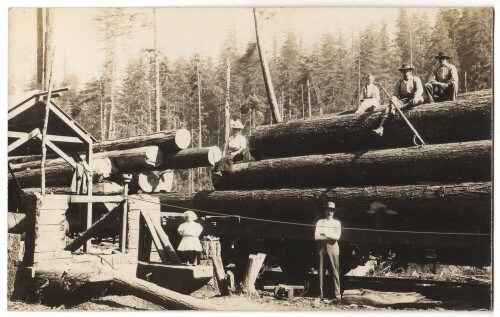 I zoomed in on it and it looks like the gentleman standing and the gentleman sitting in the middle on the top log may have wooden legs, a real hazard of a dangerous life. My great grandpa Billy Kirk had one.